Interested in finding out more about Clear Aligners? Come visit us for a complimentary Orthodontic consultation! 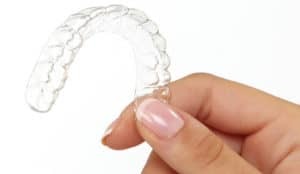 Clear Aligners are similar to the widely familiar Invisalign aligners. It is an exciting new technology that straightens your teeth with a series of clear, customized, removable aligners. The aligner is a thin piece of medical grade plastic that fits over the teeth like a glove would fit on a hand. Hardly anyone can tell you’re going through treatment and because the aligners are removable, you can eat whatever you want during treatment. Because there are no metal wires and brackets, the aligners are more comfortable than traditional braces. And because they are removable, eating, brushing and flossing are no problem. You can still enjoy your favorite foods and smile without holding back. With Clear Aligners, there’s nothing to hide. In both clinical research and in orthodontic practices nationwide, clear aligners have been proven effective at straightening teeth. Treatment takes about the same length of time as traditional braces and is far more comfortable. Thousands of patients are taking advantage of this revolutionary treatment. Throughout treatment, we will arrange for check-up appointments about every six weeks to make sure that treatment is progressing as predicted. As treatment nears completion, Dr. Vaziri will design a retention plan to help you keep your smile for life. Call/Text (908) 737 -1313 today to set up an appointment.